While November produced a mixed bag of opinions from working investors about the immediate future of investing in America, the month did not go well for retired investors. Spectrem’s Investor Confidence Index showed a drop of confidence among Millionaires and an increase of confidence among non-Millionaires, but the same index for retired investors showed a decrease in investment interest in all of the equity markets. The overall confidence index for working investors was 14, and it reached 17 among Millionaire working investors. In both cases, that was a drop of 3-4 points from the previous month. For retired investors, the overall index was at minus-4, the first time in three months it went into negative territory, and for Millionaire retired investors it went to minus-1 from a 9 the previous month. Interest in Stock Mutual Fund investing among retired investors dropped from 33.3 percent in October to 24.3 percent in November. That’s almost 20 percent less interest in Stock Mutual Funds than the 43 percent of working investors who plan to expand investing in that market. The decrease in interest in Bond Mutual Funds fell from 18.9 percent to 15.5 percent among retired investors while working investors increased their interest in Bond Mutual Funds to 14.1 percent. That remains the one market in which retired investors are more involved than working investors. The other key indicator in the Spectrem Investor Confidence Index is the percentage of investors who are not going to expand their exposure by investing more in the coming month. For retired investor, 46.6 percent said they are not investing in December, compared to just 40.4 percent from the previous month. Again, the working investors had the opposing view, with only 25.8 percent not investing in the coming month compared to 27.7 percent the previous month. The one investment option in which more working and retired investors indicated an interest in investing was Real Estate. Among working investors, interest went from 5.2 percent to 10.2 percent, nearly double in one month, while retired investors went from 3.1 percent to 7.8 percent. The Spectrem Investor Confidence Index also includes the Household Outlook, which considers the long-term prospects for four key household economic indicators. Working investors generally have a higher Outlook than do retired investors, and in November, the difference was just under 10 points, 32.42 to 22.57. However. The difference dropped from 18 points to 10, as retired investors improved their Outlook and working investors saw their Outlook drop to one of the lowest levels in 2017. 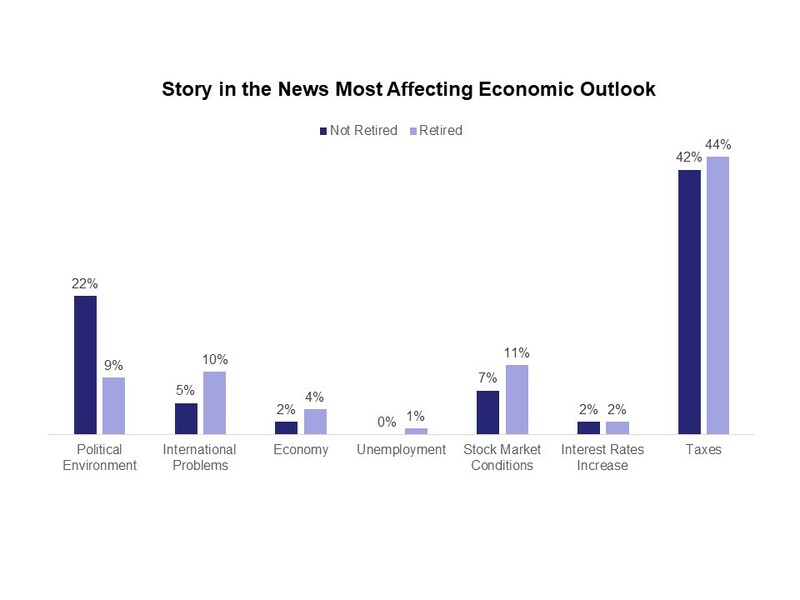 The Spectrem Confidence Index asks one question monthly regarding current economic events, and in November the question was “what story in the news is most affecting your economic outlook?” For all investors, the answer was taxes (with tax reform the hot story in the news) but retired investors were more likely to agree, with 44 percent saying taxes was the most important story, while just 42 percent of working investors felt that. Retired investors were almost more likely to choose international relations and the stock market than working investors, among whom 22 percent instead chose political environment.